Emilio Gordoa is a Mexican musician, composer and vibraphonist. He is involved in numerous projects, mostly related to experimental music, noise, free jazz, improvisation and contemporary music. 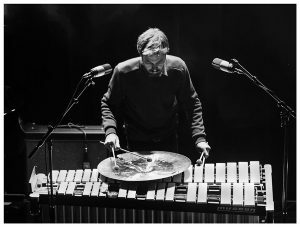 He is redefining the vibraphone as a source, treating it with preparations and extended techniques, and is a busy composer as well, writing graphic scores for a variety of ensembles, large and small, for theatre, documentary films and mixed media projects. Emilio Gordoa performed on the Procrustean Bed series with “color music”.